Background: Panax ginseng has been used as a traditional medicine for various pathological conditions. Ginsenoyne C (GSC) is a polyacetylene, minor constituent. Objective: The objective of the present study was to determine the anti-inflammatory activities of GSC for the protection of inflammation. Materials and Methods: The effects of GSC on cell viability and nitric oxide (NO) production in lipopolysaccharide (LPS)–induced RAW 264.7 cells were investigated through MTT assay and the Griess reaction, respectively. The levels of inflammatory cytokines such as interleukin (IL-1β) and IL-6 and inducible NO synthase (iNOS), cyclooxygenase-2 (COX-2), and pERK were measured using enzyme-linked immunosorbent assay and Western blot analysis, respectively. Results: GSC suppressed NO production in LPS-induced RAW 264.7 cells. GSC suppressed the production of inflammatory mediators through downregulating phosphorylation of extracellular regulated kinases signaling in LPS-induced RAW 264.7. Conclusion: GSC has a potential therapeutic agent for protection of inflammation. GSC has potential as an anti-inflammatory agent to protect inflammation. Panax ginseng, belonging to Araliaceae, has been used as traditional remedies of various pathological conditions for centuries. Many studies were reported on the pharmacological effects of ginseng such as antineoplastic, antitumor, antioxidant, neuroprotective, anti-inflammatory, antinociceptive, and anti-stress activities.,,,,,, Ginsenosides, triterpenoidal saponins, are known to be major active components of P. ginseng.,,, On the other hand, polyacetylenes were considered to be minor constituents in P. ginseng, and their biological effects have only been evaluated in the recent years. It was reported that Ginsenoyne C (GSC) was a polyacetylene isolated from P. ginseng; however, its bioactivities have not yet been reported. When the immune system malfunctions, leading to the activation of various stimuli such as proinflammatory cytokines and other mediators, the process is known as inflammation., This defense response of the body can arise in response to injuries of multiple pathologies and if misdirected, can cause autoimmune diseases and other illnesses. Macrophages are major effector cells in the inflammatory reaction and are activated in response to lipopolysaccharide (LPS), interferon (IFN)-γ, and β-amyloid. Activated macrophages produce proinflammatory enzymes involving cycyooxygenase-2 (COX-2), inducible nitric oxide synthase (iNOS), and proinflammatory cytokines involving tumor necrosis factor (TNF)-α and interleukin (IL)-1β, IL-6, and inflammatory mediators relating NO.,, Production of excessive inflammatory mediators could lead to decreased expression of the anti-inflammatory response and are associated with rheumatoid arthritis, autoimmune disorders, microcirculatory dysfunction, neuropathological diseases, and tissue damage., Inhibition of inflammatory mediator release may be an effective therapeutic strategy to protect diseases caused by an inflammatory response. Mitogen-activated protein kinases (MAPK) plays a pivotal role in inflammation and a family of serine/threonine protein kinases has been identified that mediate biological processes and cellular reaction to external stress stimulus.,,,, Regulation of activated MAPK such as extracellular signal-regulated kinase (ERK), protein 38 (p38), c-jun NH2-terminal kinase (JNK), and inflammatory mediators at activation of signal transcription make them potential targets for anti-inflammatory therapeutics. As a part of our ongoing searching program to investigate the anti-inflammatory properties of phytochemicals, we investigated the anti-inflammatory activities of GSC in LPS-induced murine macrophages. In the study, we assessed anti-inflammatory activities of GSC from P. ginseng roots in LPS-induced murine macrophages. The fermented ginseng extract (FGE), prepared by patented process was provided from Greencrosshs (Sungnam, Korea). Concisely, the roots of P. ginseng was continually extracted with ethanol and then reacted with an enzyme including ginsenoside-β-glucosidase. The residue was conducted acid hydrolysis reaction and the reactant was eluted from Diaion HP-20 resin using water-95% ethanol gradient and as a mobile phase. Powders of the FGE (90 g) were used for silica gel column chromatography (20 cm × 5 cm column) using a gradient elution of solvents (CHCl3: CH3 OH = 10:1, 7:1, 5:1, 3:1 → 100% CH3 OH) to yield 24 fractions (FGE1–24). FGE 3 was chromatographed by RP C18 column chromatography with a mixture of CH3 OH and H2O (30:70 → 100:0) and obtained 17 subfractions (FGE3-1-17). FGE 3–7 was purified on a preparative HPLC (CH3 CN: H2O = 45:55, 2 mL/min) and yielded GSC (8.7 mg). GSC – brownish syrup; C17H24O3; ESIMS (negative mode): m/z 276.17 [M-H]-; 1H-NMR (CDCl3, 500 MHz) δH6.21 (1H, ddd, J = 17.1, 10.2, 5.3 Hz, H-2), 5.83 (1H, ddd, J = 17.0, 10.0, 6.5 Hz, H-16), 5.62 (1H, ddd, J = 17.1, 1.9, 1.4 Hz, H-1a), 5.20 (1H, ddd, J = 10.1, 1.4, 1.4 Hz, H-1b), 5.31 (1H, br d, J = 3.3 Hz, H-3), 5.21 (1H, d, J = 17.0 Hz, H-17a), 5.10 (1H, d, J = 10.0, H-17b), 4.07 (1H, br q, H-9), 3.99 (1H, br q, H-10), 3.01 (1H, dd, J = 16.9, 5.5 Hz, H-8a), 2.89 (1H, dd, J = 16.9, 6.9 Hz, H-8b), 2.25 (2H, q, J = 5.9 Hz, H-15), 1.18 (2H, m, H-11), 1.70 (2H, m, H-12), 1.51 (4H, m, H-13,14);13 C-NMR (CDCl3, 125 MHz) δC138.9 (C-16), 136.9 (C-2), 117.8 (C-1), 115.4 (C-17), 80.4 (C-7), 76.4 (C-4), 73.4 (C-10), 73.2 (C-9), 70.6 (C-5), 66.4 (C-6), 63.0 (C-3), 34.1 (C-11), 32.0 (C-15), 30.1 (C-13), 29.6 (C-14), 26.6 (C-12), 25.3 (C-8). RAW 264.7 cells were obtained from the KCLB. The cells were maintained in DMEM supplemented 10% heat-inactivated FBS, penicillin, and streptomycin solution, and cultured at 37°C humidified atmosphere with 5% CO2. Cells were cultured in serum-free DMEM medium with various concentration of GCS for 1 h and stimulated with LPS for indicated times. Cell viability was evaluated using a cell counting kit-8 assay kit (Dojindo. Japan). All experiment was used 1 μg/mL of LPS. The cells were treated with GSC for 1 h and were stimulated with LPS for 24 h. After incubation, the culture media was mixed with an equal amount of Griess reagent, incubated at RT for 15 min, and measured at 550 nm using a microplate reader (BioTek Instruments, Inc, Winooski, USA). RAW 264.7 cells were seeded and pretreated with or without GSC and stimulated with LPS. The whole cell lysates were suspended in a protein extraction solution. Equal amounts of protein were separated by 10% sodium dodecyl sulfate-polyacrylamide gel electrophoresis (SDS-PAGE) and transferred to polyvinylidene difluoride (PVDF) membranes (Millipore, MA, USA). The membrane was blocked with 5% skim milk in plain buffer (20 mM Tris (pH 7.4), and 136 mM NaCl) and incubated with primary antibodies (SantaCruz Biotech, CA, USA). The membrane was incubated with specific-HRP conjugated antibodies (SantaCruz Biotech, CA, USA). The immunoreactive bands were exposed to enhanced chemiluminescence Western blot analysis detection reagents (ThermoFisher Scientific, Waltham, MA, USA), and were analyzed using a Bio imaging-system (MicroChemi 4.2 Chemilumineszenz-System, Israel). The concentration of cytokines in culture media of murine macrophage was measured using enzyme-linked-immunosorbent assay (ELISA) kits (Cusabio, Wuhan, China). The statistical differences were determined through a “one-way ANOVA” test using a computerized statistical package. Differences were considered statistically significant at P < 0.05. GSC was obtained as brownish syrup from powders of the FGE through repeated column chromatography. From the negative ESIMS at m/z 276.17 [M-H]-, its molecular formula was determined as C17H24O3. The structure of GSC was confirmed as a compound of the polyacetylene series based on comparison with data from the previous literature [Figure 1]. Polyacetylene-based compounds have been reported to be isolated from ginseng extract, but their pharmacological activity is not yet known. The cytotoxicity of GSC was assessed by quantitating cell viabilities in the presence of the GSC, as shown in [Figure 2]. GSC exhibited no toxic effects on the cells over a concentration range from 1 to 10 μM. Proinflammatory macrophages produce high levels of a pleiotropic molecule, nitric oxide (NO), that plays an important role a range of physiological and pathological inflammatory reactions., This molecule is classically generated from iNOS and L-arginine., To assess its inhibitory activities on NO production, cells were treated with GSC for 1 h, stimulated with LPS for 24 h, and NO production in culture media was evaluated through the Griess reaction. NO production was found to have been concentration-dependently reduced by this compound [Figure 3]. The enzymes, iNOS and COX-2, are involved in the generation of pro-inflammatory mediators in activated cells., To further study the inhibitory activities of GSC, expression of COX-2 and iNOS was measured through Western blot. Cells were pretreated with GSC for 1 h followed by addition of LPS and incubated for 24 h. Protein levels of COX-2 and iNOS were not detectable in basal murine macrophages, but LPS stimulus caused a dramatic increase in activation of COX-2 and iNOS. 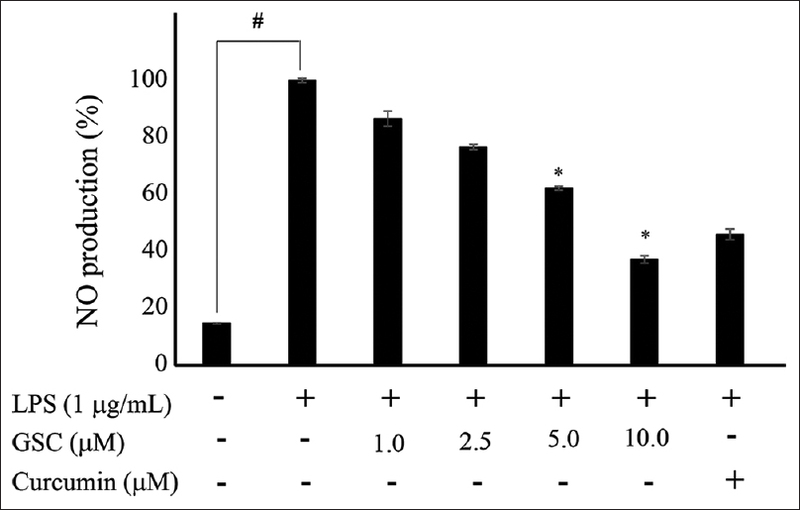 However, the corresponding level of GSC-treated cells was shown to be concentration-dependently reduced [Figure 4]. These results showed that GSC-mediated inhibition of NO production was associated with inhibition of COX-2 and iNOS level. The levels of pro-inflammatory cytokines are increased during inflammatory and immune responses, and play an important role in the development of inflammatory diseases. It is well established that cellular exposure to LPS causes the secretion of inflammatory cytokines that lead to the inflammatory reaction. To assess the anti-inflammatory effects of GSC on cytokine production in LPS induced macrophages, the cells were treated with GSC for 1 h and stimulated LPS for 24 h, and the content of cytokines in culture media was measured using ELISA. 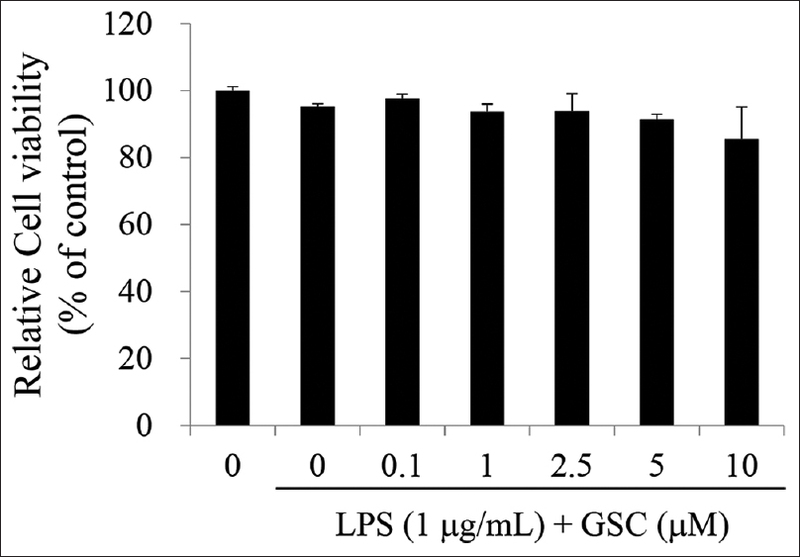 Treatment of GSC concentration-dependently suppressed these IL-1β and IL-6 production, compared to LPS alone [Figure 5]. MAPK activation is considered to be major mechanisms underlying inflammation and are involved in the regulation of pro-inflammatory mediators.,,, To examine whether the inhibition of inflammatory mediator secretion by GSC is mediated through a MAPK pathway, we assessed the effect of GSC on LPS-induced activation of ERK 1/2, p38, and JNK by the Western blot analysis. Murine macrophages were pretreated with GSC for 24 h and then followed by LPS stimulation for 15 min. As shown in [Figure 6], treatment of GSC resulted in the inhibition of LPS-induced activation of ERK 1/2, whereas it did not affect p38 and JNK phosphorylation. These results suggest that the suppression of one of the MAPK constituents plays a crucial role in decreasing GSC-induced anti-inflammatory actions. Studies regarding the anti-inflammatory activities of GSC also included the modulation of inflammatory proteins and cytokines. Moreover, GSC suppressed ERK 1/2 phosphorylation in LPS-stimulated murine macrophage cells. The study results were the first results that GSC isolated from the root of P. ginseng plays a pivotal role in the anti-inflammatory activities of LPS-induced murine macrophages, and that GSC may reduce inflammatory mediators during exposure to LPS stimulation through down-regulation of MAPK phosphorylation. We suggested that GSC is highly promising for development as therapeutic agents in inflammation. This work was supported by the National Research Foundation of Korea grant funded by the Korea government (MSIP) (No. NRF-2017R1C1B2005934). Ahn GI, Park CH, Lee EO, Lee HJ, Lee JH, Kim KH, et al. Apoptotic Effect of Ethanol Extracts of Ojungbangamtang and acidic polysaccharide of Korea red ginseng in a MCF7/adR multidrug-resistance breast cancer cells. Yakhak Hoechi 2006;50:272-7. Patel S, Rauf A. Adaptogenic herb ginseng (Panax) as medical food: Status quo and future prospects. Biomed Pharmacother 2017;85:120-7. Dai D, Zhang CF, Williams S, Yuan CS, Wang CZ. Ginseng on cancer: Potential role in modulating inflammation-mediated angiogenesis. Am J Chin Med 2017;45:13-22. Lee WM, Kim SD, Kim KS, Song YB, Kwak YS, Cho JY, et al. Protopanaxadiol Modulates LPS-induced inflammatory activity in murine macrophage RAW264.7 Cells. J Ginseng Res 2006;30:181-7. Kang KS, Yokozawa T, Yamabe N, Kim HY, Park JH. ESR study on the structure and hydroxyl radical-scavenging activity relationships of ginsenosides isolated from Panax ginseng C A meyer. Biol Pharm Bull 2007;30:917-21. Yin H, Park SA, Park SJ, Han SK. Korean red ginseng extract activates non-NMDA glutamate and GABAA receptors on the substantia gelatinosa neurons of the trigeminal subnucleus caudalis in mice. J Ginseng Res 2011;35:219-25. Kim EH, Kim IH, Ha JA, Choi KT, Pyo S, Rhee DK, et al. Antistress effect of red ginseng in brain cells is mediated by TACE repression via PADI4. J Ginseng Res 2013;37:315-23. Choi KT. Botanical characteristics, pharmacological effects and medicinal components of Korean Panax ginseng C A Meyer. Acta Pharmacol Sin 2008;29:1109-18. Shibata S. Chemistry and cancer preventing activities of ginseng saponins and some related triterpenoid compounds. J Korean Med Sci 2001;16 Suppl: S28-37. Liu Y, Zhao J, Chen Y, Li W, Li B, Jian Y, et al. Polyacetylenic oleanane-type triterpene saponins from the roots of Panax japonicus. J Nat Prod 2016;79:3079-85. Murata K, Iida D, Ueno Y, Samukawa K, Ishizaka T, Kotake T, et al. Novel polyacetylene derivatives and their inhibitory activities on acetylcholinesterase obtained from Panax ginseng Roots. J Nat Med 2017;71:114-22. Yang MC, Seo DS, Choi SU, Park YH, Lee KR. Polyacetylenes from the roots of cultivated-wild ginseng and their cytotoxicity in vitro. Arch Pharm Res 2008;31:154-9. Ahmed AU. An overview of inflammation: Mechanism and consequences. Front Biol 2001;6:274-81. Guha M, Mackman N. LPS induction of gene expression in human monocytes. Cell Signal 2001;13:85-94. Marks-Konczalik J, Chu SC, Moss J. Cytokine-mediated transcriptional induction of the human inducible nitric oxide synthase gene requires both activator protein 1 and nuclear factor κB-binding sites. J Biol Chem 1998;273:22201-8. Vane JR, Mitchell JA, Appleton I, Tomlinson A, Bishop-Bailey D, Croxtall J, et al. Inducible isoforms of cyclooxygenase and nitric-oxide synthase in inflammation. Proc Natl Acad Sci U S A 1994;91:2046-50. Joung EJ, Lee B, Gwon WK, Shin T, Jung BM, Yoon NY, et al. Sargaquinoic acid attenuates inflammatory responses by regulating NF-kB and Nrf2 pathways in lipopolysaccharide-stimulated RAW 264.7 Cells. Intl Immunopharmacol 2015;29:693-700. Solinas G, Marchesi F, Garlanda C, Mantovani A, Allavena P. Inflammation-mediated promotion of invasion and metastasis. Cancer Metastasis Rev 2010;29:243-8. Valledor AF, Comalada M, Santamaría-Babi LF, Lloberas J, Celada A. Macrophage proinflammatory activation and deactivation: A question of balance. Adv Immunol 2010;108:1-20. Turner MD, Nedjai B, Hurst T, Pennington DJ. Cytokines and chemokines: At the crossroads of cell signaling and inflammatory disease. Biochim Biophys Acta 2014;1843:2563-82. Medzhitov R, Horng T. Transcriptional control of the inflammatory response. Nat Rev Immunol 2009;9:692-703. Kaminska B. MAPK signalling pathways as molecular targets for anti-inflammatory therapy – From molecular mechanisms to therapeutic benefits. Biochim Biophys Acta 2005;1754:253-62. Coskun M, Olsen J, Seidelin JB, Nielsen OH. MAP kinases in inflammatory bowel disease. Clin Chim Acta 2011;412:513-20. Le Y, Iribarren P, Gong W, Cui Y, Zhang X, Wang JM, et al. TGF-beta1 disrupts endotoxin signaling in microglial cells through smad3 and MAPK pathways. J Immunol 2004;173:962-8. Seo JY, Lee JH, Kim NW, Her E, Chang SH, Ko NY, et al. Effect of a fermented ginseng extract, BST204, on the expression of cyclooxygenase-2 in murine macrophages. Int Immunopharmacol 2005;5:929-36. Seyidova D, Aliyev A, Rzayev N, Obrenovich M, Lamb BT, Smith MA, et al. The role of nitric oxide in the pathogenesis of brain lesions during the development of Alzheimer's disease. In Vivo 2004;18:325-33. Salvemini D, Misko TP, Masferrer JL, Seibert K, Currie MG, Needleman P, et al. Nitric oxide activates cyclooxygenase enzymes. Proc Natl Acad Sci U S A 1993;90:7240-4.